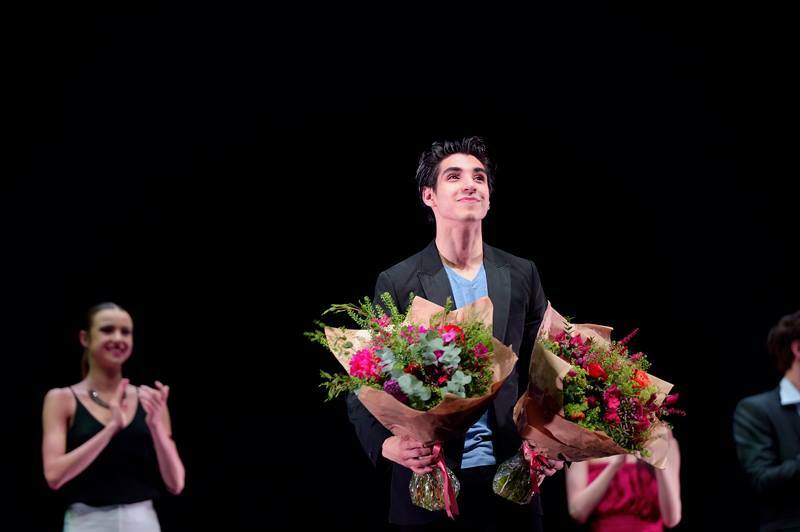 Junior Soloist Cesar Corrales won the English National Ballet’s Emerging Dancer award at the London Palladium on 17 May. He performed Contrabajo para hombre, a solo by Julio Lopez, and the pas de deux from Diana & Acteon with fellow finalist Rina Kanehara. The Emerging Dancer competition also gives a People’s Choice Award which is voted for by the public throughout the season, and Corrales won this too. Judges and public in full agreement. I am so honoured and thankful to have won both prizes. Performing at the London Palladium was incredible and it was wonderful to dance in front of an audience that was so appreciative of what they were seeing. Cesar is a very charismatic artist. He has an incredibly polished classical technique, and the ability to move in many different ways. Having performed on stage since he was a young boy, he understands audiences and how to perform for them. I’m not surprised that British audiences have fallen in love with him. Jennie Harrington received the Corps de Ballet Award, a new award introduced this year and presented to an exceptional Artist of the Company who has gone above and beyond the call of duty over the last season. I am so honoured to have won this award. It’s more than I could ever have imagined. I feel very lucky to be part of this amazing company, and I am incredibly grateful to Tamara and the whole of the Artistic team for picking me as their winner. Previous winners of the Emerging Dancer Award include Yonah Acosta (2012), who is now Principal of English National Ballet, Shiori Kase (2011), and Junor Souza(2014), who have since been promoted to First Soloist, Alison Mcwhinney (2014) who was promoted to Soloist last year, and Jinhao Zhang (2015), recently seen performing in the lead roles of Ali and Lankendem in Le Corsaire at the London Coliseum in January this year.